Fukatsu Ryo (Namiki Akie) stabbed a teacher to death when she was 14 who treated her as an arsonist. 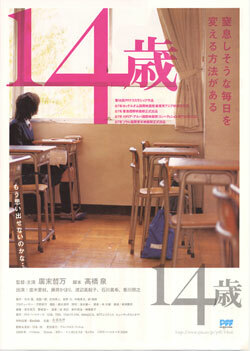 Twelve years later, Fukatsu is a teacher at a middle school whilst remaining traumatized by the incident. One day Fukatsu is reunited with Sugino (Hirosue Hiromasa) who was a classmate at middle school. Sugino has been teaching piano to one of Fukatsu’s pupils. He is also burdened with a psychological scar. It was verbally inflicted upon him when he was 14 and he gave up playing his favorite piano as a result. Both Fukatsu and Sugino reached adulthood without recovering from their trauma, but they start facing their issues from the past and finding hope to live by keeping company with the 14-year-olds with all sincerity who are living in the present whilst being troubled just as they are.